Praying Mantis, originally uploaded by needlepointernc. I usually hate INSECTS but this one is too cute to hate! It is another great creation by Joe Carnavale (who did the barrel monsters in the last few years in Raleigh). 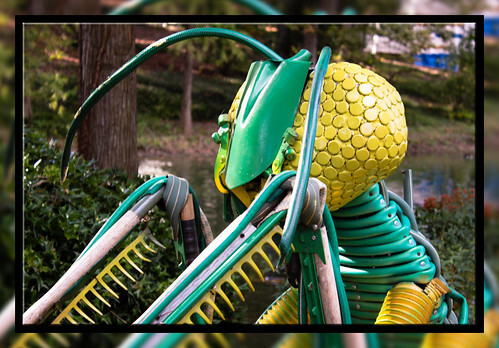 This giant praying mantis was in the garden at the 2011 NC State Fair. This is the kind of insect I don’t mind seeing. Very creative. Wonderful creation and you have captured it well as is your forte!